On the weekend of November 30 – December 2, participants from the 2006 & 2007 summer journeys came together in New Orleans for our first ever reunion. It was a smashing success! We chose New Orleans because it is one of the major cities that we are not able to visit during the summer. It also, unfortunately due to Hurricane Katrina, has many valuable lessons for us to learn about the state of our country. It also has its own culture and flavor. Our weekend began by visiting Beth Israel, an Orthodox synagogue that was destroyed by the floods of Katrina. We got a tour of the condemned building by the President of the congregation. After seeing the destruction we had the pleasure of joining the congregants in their temporary dwelling in the Reform synagogue. As the Rabbi said, it was a powerful experience for us to see where the congregation has been and what it had gone through and then to join them in their rebuilding process. The teens got to hear first-hand accounts of what it was like to live through Katrina when we had dinner with the congregants. The next day we had a walking tour through their famous cemetaries, Congo Square park, and the French Quarter. Our tour guide taught us about the voodoo culture of New Orleans while showing us the sites. It was interesting to see how Judaism has similar ideas and rituals as the voodoo culture. After lunch at a coffee shop in the French Quarter we went to see the destruction of Katrina up close by going to visit the Lower 9th Ward. We sat at the levee and had a discussion about the events that led up to Katrina and tried to comprehend why two and a half years later we were still able to see the trash and destruction. We followed up our discussion by working with a group called “Make It Right” foundation. They are dedicated to building affordable housing that are partially run by solar power. We helped by cleaning up an area around the houses they were building that they were going to show off to the media. 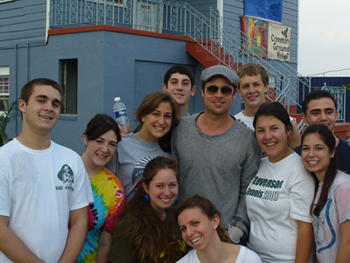 Brad Pitt is very involved with this project and he drove up as we were working. To the thrill of the teens, the boys included, he came up to us to shake our hands, talk for a few minutes and take pictures. After our clean up project we went back to the hotel to rest and get ready for our night on the town. We went to dinner in the French Quarter and then had one of the highlights of the trip. We went to the world-famous Preservation Hall where we experienced Dixieland Jazz. first-hand with the excellent house band. On Sunday we went to a Gospel Jazz Church service. It was quite a difference from what we are used to from our synagogues. The choir and band were energizing. We also got to witness 8 pre-teens baptized. We ended our stay in the Big Easy by having some free time shopping in the French Quarter.